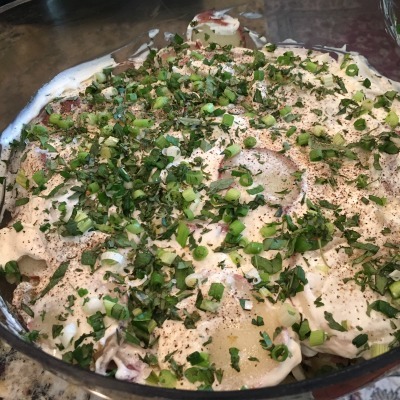 There is only one potato salad allowed in our house and my mother-in-law is the keeper of the recipe. This is one of those meals that is required to know for marriage. I have a sweet husband and he only has maybe 3 or 4 recipes that fit into this category, but if they are one of those I better not attempt to mess with them. 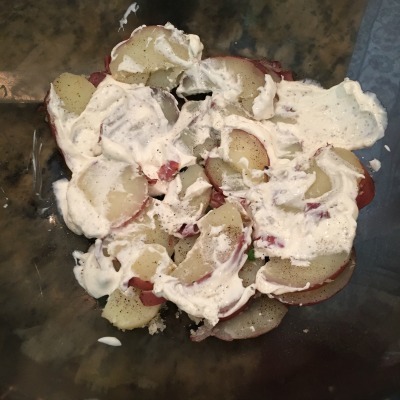 To his credit this is the best potato salad I’ve ever had! I don’t like mustard base, egg bits or pickles so that rules out almost every other “traditional” recipe. As a special treat for you I pestered my sweet mother-in-law into making a batch for our July 4th party yesterday. I also got her permission to share the recipe with you. New Hellmann’s Organic Mayonnaise tastes just as good as what we’ve used in the past, but now I can make organic versions of my favorite “cheat foods” at cookouts. One ingredient we used might be very new to you. The new Organic Hellman’s Mayo. Their organic mayo is made with cage-free eggs and organic expeller-pressed oil, plus contains no artificial flavors or preservatives. New Hellmann’s Organic Mayonnaise tastes just as good as what we’ve used in the past, but now I can make organic versions of my favorite “cheat foods” at cookouts. 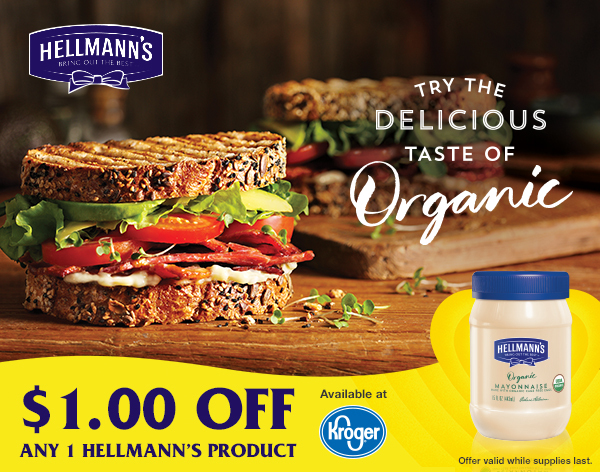 When you head to Kroger to pick up your Organic Hellmann’s Mayonnaise, make sure you grab all of the ecoupons for everything on your list. You can also print a Hellmann’s coupon. So let’s get to this recipe. It’s going to be a hit no matter where you serve it! 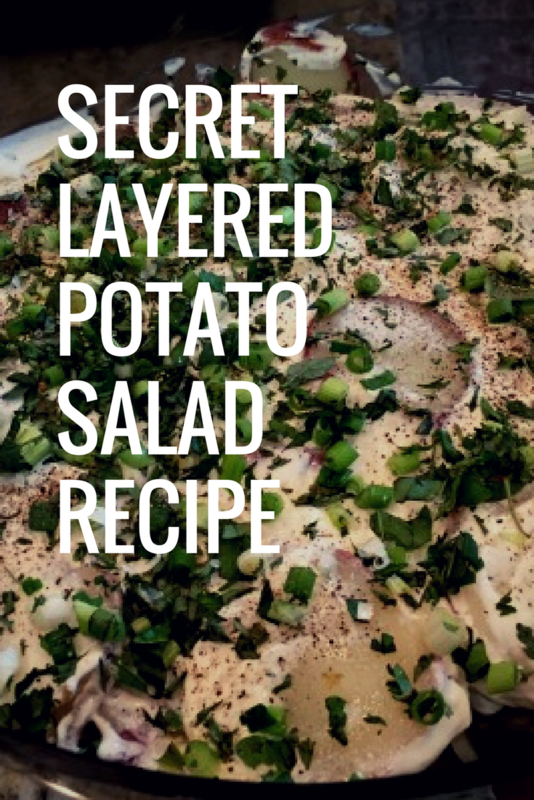 You can also play around a lot with more or less horseradish, extra fresh leafy spices and even more onions. Make it yours however you like, it will be amazing! Boil whole potatoes until they are fork tender (12-15 minutes depending on the size of potatoes). You can prewash if you want, or let the boiling water do the work for you. Remove any eyes on them though before cooking. Drain well and then cool potatoes enough to be able to handle. 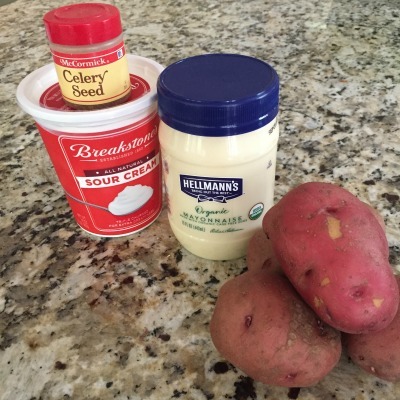 While Potatoes are cooling, mix together Hellman’s Organic Mayo, Sour Cream, Horseradish and celery seed together, keep in the fridge until you need it. Slice potatoes about 1/4 in thick. Do not peel potatoes. It’s okay if they fall apart a bit no one will know or see that when you put it all together. We’ve tried slicing them before boiling and that doesn’t work. So stick with slicing them after cooking. In large bowl start a layer potatoes slices, then salt and paper. 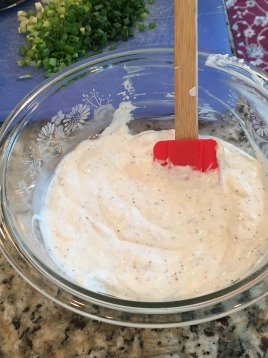 Add thin layer of mayo/sour cream mixture. Sprinkle with green onions and parsley. Repeat this layering until bowl is full. Top salad with any leftover mayo mixture, green onions and parsley. 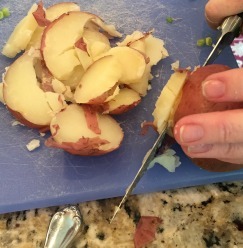 Don’t forget to add salt and paper to every layer of potatoes before the mixture is added! Potatoes need salt, I promise. This is also great with an left over fresh herbs you may have (it’s really great with chopped oregano and basil). It’s better to put together the day before and let it rest in the fridge over night before serving. If you run out of green onions just finely chop a regular onion. How do you cook with your #RealGoodMayo?